The Whitaker Trail is a single-track trail, can be quite muddy in places, but bikeable most of the way. Start on the trail for maybe 1/4 mile, then you will come to a junction labeled 'Main Trail'. Take the left fork here, up the trail with the handrail. If you take the right, you will come out a lot farther away. From the junction it’s a 1/2 to 3/4 mile climb to Eagle Lake drive, and from there you can work your way to Snoqualmie Pkwy and the trail there. 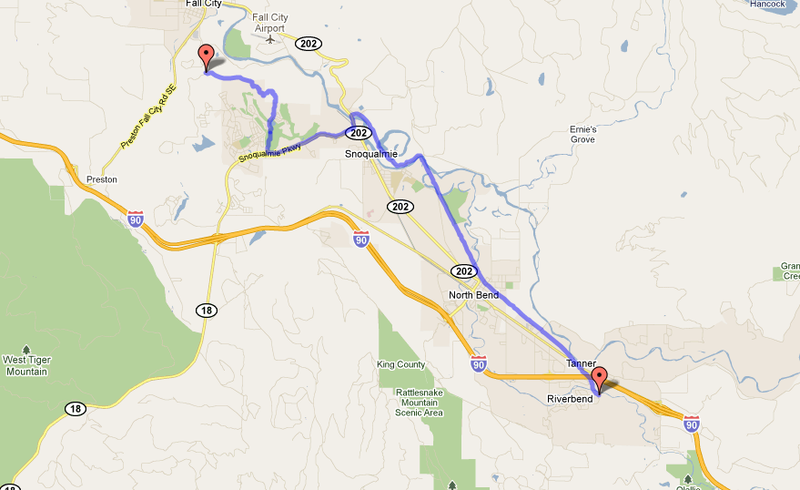 Follow the trail down (east) along Snoqualmie Pkwy to Railroad, stay on the sidewalk and cross the bridge. On the other side, cross and connect to SE Mill Pond Road. Follow it east till it joins Reinig Rd. This short (1/4 mile?) section is narrow-shouldered, but easy enough to ride, just watch for cars. Click here for Section 4.